Sazerac is a word with many definitions. Originally the name of a bar in 1860s New Orleans, Sazerac became the name of its signature cocktail, a mixture of cognac and bitters. Later, when cognac became scarce the recipe was changed to use (probably Canadian) rye whiskey. Thomas Handy, the bar’s proprietor, began importing liquors and founded The Sazerac Company, which today owns (among others) industry bigs like Buffalo Trace, Pappy Van Winkle, and Barton Brands. 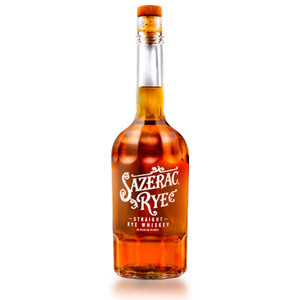 Its Sazerac Rye brand is a reminiscence of that earlier time, and the “official” rye for use in Sazerac cocktails. 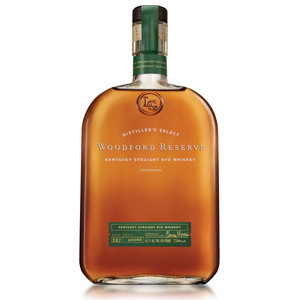 An 18 year-old version of this recipe is part of Buffalo Trace’s popular annual Antique Collection release. 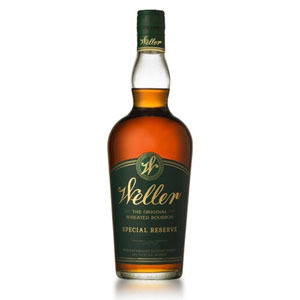 Unlike the Antique Collection expression, this non-age-statement bottling is a basic rye with mass-market sensibilities intended for mixing into cocktails. See my notes below. Nose: Bourbon nose. Sweet corn and corn syrup. Black pepper. Cherry pits, nutmeg and cayenne. Fair bit of that bourbon new-plastic smell. Heavy nose prickle. Palate: Smoky black pepper up front, woody and charred. Resolves into sweet cherry syrup and spice notes. Rye, but still bourbon-y (corny?). Finish: Long, and very oaky. Some nice grilling spices, mulled cider, and smoky hardwood chips. Overall: Not bad. A lot more corn than I usually like in my ryes, but flavorsome and smooth. 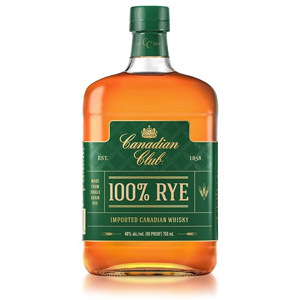 No doubt the large majority of this rye’s production is used for making cocktails, as there are much better sipping ryes available (personally for the money, I much prefer Rittenhouse 100, when I can find it). I would therefore say this is ‘Not Recommended’ unless you’re making cocktails, for which Sazerac is well-suited. Kudos to the company, however, for keeping this at 90 proof instead of the more-common anemic 80. Sazerac is my absolute favorite rye for making an Old Fashioned. I’ve tried most ryes out there, and nothing is better than Sazerac in that cocktail. I also enjoy it neat, but it really does shine more in cocktails. I find the Rittenhouse 100 everyone loves to be overrated and even harder to find that Sazerac. I would recommend Willett Straight Rye 4 year for sipping. They seem to be carrying it at most Bevmo’s right now. Hi Allen, thanks for the comment. I agree that Sazerac is good for cocktails, although with all the straight whisky I drink for this blog, I very rarely end up drinking any cocktails! For that reason, I don’t attempt to rate whiskies on their mix-ability, beyond mentioning their reputation for such. The Rittenhouse 100, conversely, I feel is not very good in cocktails, as its spiciness doesn’t seem to meld well with other flavors. I do very much enjoy it straight, when I can find a bottle. For my style of drinking, I just wouldn’t keep a bottle of Sazerac around. Well I tried some of the Rittenhouse 100 again today, and I was once again unimpressed. For my money I’d take Sazerac over it since it’s a dual threat in that I like it neat and it shines in cocktails. I like spicy ryes, and I don’t consider this spicy at all. In fact it’s more like a high rye content bourbon such as Old Grand Dad (don’t let the price fool you, it’s actually pretty good). I’d rather save 8 to 10 bucks and get Old Overholt or Jim Beam Rye at this price point. For sipping neat I’ll stick to High West Double Rye, Willett Straight Rye 4 year, Jefferson’s Straight Rye 10 year, or even Russell’s Reserve 6 year. If you really like rye then splurge on High West Rendezvous Rye, it’s very good. If you want an ultra premium rye the Rittenhouse 25 year was delicious, but it’ll cost you about $200 for a bottle. Hi Allen. Everyone has their preferences, I guess. That’s one of the joys of discovering and experimenting with whisky – settling on your favorites and being content in the knowledge that you’ve tried the other options and that you know what you like. I feel the same way about a handful of lower-priced single malts that tend to get snubbed these days. They will always have a place in my cabinet. I have had a taste of Rendezvous Rye, and I do agree – one of the tastiest American whiskies around. The first time I attempted to make on Old Fashioned I used Sazerac and it was delicious. Had I used something else I probably never would have tried making one again. I’ve tried every combination of rye, bitters, and sugar you can think of and I always come back to that first cocktail I made. I was at Bevmo today and they actually had quite a few Rittenhouse 100’s so I thought I would give it another shot since it has been a few years since I had it. I vaguely remember having a decent Manhattan with it, although I still have not found the right combination of ingredients to really appreciate a Manhattan. This was my first Rye whiskey. I usually drink various bourbons on the rocks and with a twist of lemon rind. I have been mixing Buffalo Trace with Pepsi, as my “go to” drink for several years. I have had many bottles of Rye in my hand to purchase but could never pull the trigger. Sazerac Rye was recommended at the liquor store recently, so I bought it as a Christmas present to myself. I like whiskey on the rocks so I drank it first on the rocks. Several nights later I had it on the rocks with a twist, which I found much more pleasant to drink. Perhaps I’ll try it in an Old Fashion, and try Rittenhouse 100, for sipping. Thanks for the tips. Great review! I am reading this blog for the first time and I find that your reviews are accurate according to my experiences with the whiskies that I have tried so far. Great call on recommending the Rittenhouse Rye 100 proof instead of this Sazerac Rye. I have written a review on the Rittenhouse Rye on my blog (whiskydiaries.blogspot.com). If you have time please let me know what you thing. @Marius, Thanks for the comment. I like your site, and especially agree with your assessment that Glenfiddich 15 is better than the 12 *and* the 18. Good call, there. Cheers! Hi! I enjoyed your review. I am sitting at the Hilton Garden Inn in Bangor, Maine of all places, and sipping some Sazerac. Given the price point, I think this is good value for money. Yes, it is very smooth, and one might argue, not a lot of complexity, but it does deliver corn, oak, vanilla and cinammon in an intriguing manner that begs another sip. I guess what I am saying is that for the price I respectfully disagree. Within the American rye category I think this is a solid effort. 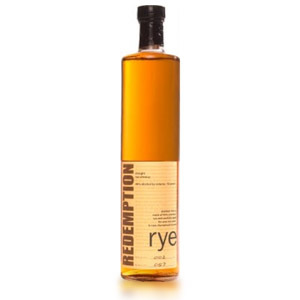 Wonderful Rye… highly recommended… great value… must own for your whiskey cabinet. I have to admit that this is one that I didn’t care for at first, except for making an old fashioned. However, I’ve gone back to it again after it’s been open for several months, and I must say that it’s growing in me. It has a very unique flavor profile…I’m not sure if dilly is an appropriate way to describe the flavor or not, but I like it. For less than $30 where I live, it’s a good buy.